The original plan for hanging the door was to use a piano hinge. This seemed like a good idea at the time, but I had a heck of a time getting the swing of the door right. I think I ended up getting a couple of holes out of true, and then the door wouldn't close all the way. I looked for solutions for a long time, and I finally settled on a wrap hinge. A wrap hinge would allow me to put the screws into the strongest part of the frame I built around the door opening, but it did require me to chisel out some hinge pockets. I liked how the wrap hinges came out. The door still didn't quite close, but it was better, and I was planning on using a magnetic catch, so that is how I "fixed" it. Bre filled and re-painted my wood-butchery, and we were ready for the final stage! Door on. You can see the door still doesn't quite close. I had pretty grand plans at the beginning. I originally wanted to make all the buttons on the front, like Bass and Treble and whatnot do things. I also wanted to light the interior, and integrate the main dial somehow. As I got into it, that turned out to be outside of my ability at present. I have a fair bit of experience with circuits and electronics, but I discovered my skills are pretty out of date. I settled on using RGBW LED strips to light the interior. I bought my LEDs from Adafruit, since they had a nice tutorial on their site for building the circuit and programming an Arduino to run the LEDs. I had some trouble with the microcontroller, which was entirely my fault. I was fooling around with the circuit while it was connected to my PC for easy code changes, but I had the LED strips powered off a separate power supply, since I didn't want to draw too much current from the USB port. That was a problem since the grounds weren't directly connected. I ended up burning up the first Arduino I bought, along with a couple of my power transistors. Oh yeah, and I fried the 10K potentiometer I was using to test the dial function. I had the silly thing directly connected to the power supply, instead of the 5V output of my Arduino. I also discovered a short in my prototyping breadboard. The contacts inside were bent, causing the power and ground on the sides of the board to touch. This all came pretty close to being the final straw. We were over two years into the project at this point, with a lot of time and effort and false starts, and I couldn't build a circuit! // initialize digital pins as outputs. All of the LEDs are modulated together. I have some features in this code what will allow me to separate out the color channels later if I feel like getting fancy with colors. I have also limited the power draw of the LEDs to only half of their scale with the fadeValue variable. In principle, it would go up to 255. But I was gun-shy after destroying my power transistors. My circuit is based heavily on the Adafuit schematics. I bought some cases and screwed them to the bottom of the cabinet, and I put the Arduino and the breadboard in the cases. I used a 2.5mm barrel jack for the power supply, and crimped ring connectors to join the power transistors to the LED power leads. I bought a long-shaft potentiometer for the dial. At this late date, I realized the potentiometer for the dial needed to interface with the complicated three-part dial of the original radio, which combined a number of functions coaxially. I bought brass bushings which fit over the potentiometer shaft to preserve the ability of all three dials to spin. I cut a panel out of 7/32" underlayment to mount the poteniometer. This will also be a place to mount buttons if I ever decide to use the radio buttons in the future. Bre painted that for me. I ran 28 AWG leads from the potentiometer to the Arduino, on the theory I wanted room for the twelve buttons on the front later to run lead through the same holes in the cabinet. In retrospect, I regret my life choices. That wire was wayyy too fine for this work, and I redid it at least twice when it broke. The power circuit, with four color channels. These are *almost* color-coded. Everything all put together. Can you tell I'm not a cable-layout purist? Once the circuit was assembled and tested, I drilled a hole in the potentiometer shaft for the last knob. That knob was cracked, so I epoxyed the shaft of an allen key into the knob and placed it into the drilled hole. We also replaced the broken glass with a new dome. I especially like how the glassware behind it looks with the LEDs on. Almost done, just one last knob to put on! As I finish this, the bar cabinet sits behind me, softly glowing. I think it might need a pull for opening the door, but that is a project for another day. This is a guest post written by my wife. She is far better than me at detail work, so here is her account. 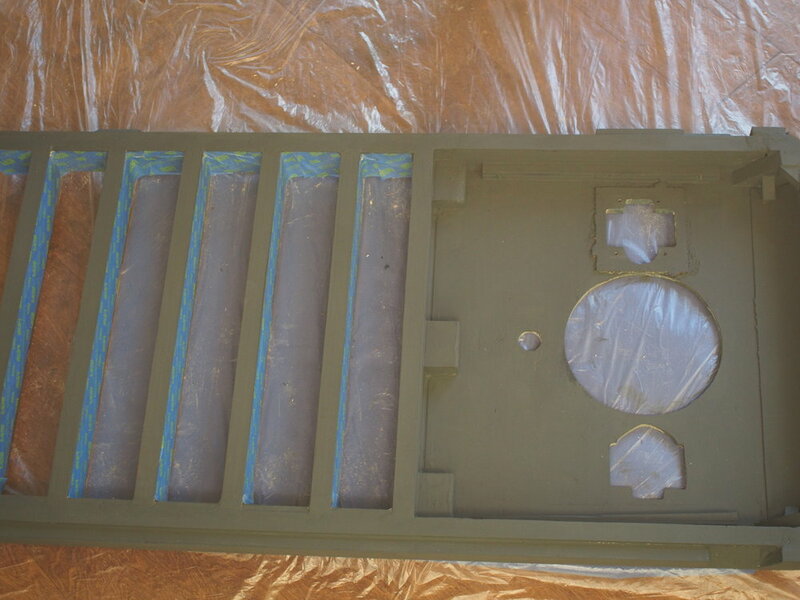 I started the refinishing work by painting the inside of the cabinet. Because the wood on the interior of the cabinet was never meant to be seen, it was not the highest quality, it was sealed with something that made it blue, and we used MDF for the shelves we made. All of this just meant that painting was our best option. I used Annie Sloan Chalk Paint in Graphite, and sealed it with the clear wax. There are more thorough tutorials on Pinterest if you are interested in the details of that process. I also used Mod Podge to glue the repair card we found in the cabinet onto one of the shelves, and to seal the the Zenith part number label. After finishing the inside, I turned my attentions to the outside. I looked up various tutorials via Pinterest to get ideas for ways to possibly/hopefully repair the cabinet without refinishing. I decided to try the Howards Resto-a-finish and Feed-n-wax combo. The products were easy to use, and did improve the appearance of the cabinet, but the finish, especially on the top, was just to far gone. It took me a long time to come to terms with the fact that I was going to have to strip and refinish the cabinet. I had never refinished anything before, so I bought some vintage desks and did those first so that I would have some experience with the process. It also took some time to find replacements for the labels by the knob, as well as a replacement for the faux finish on the front of the cabinet where the speaker fabric used to be. Also, I was pregnant and everything just takes longer and is more emotional then it needs to be, so if you're wondering why it took us so long to finish...there you go! I decided to strip the cabinet with our orbital sander instead of using a chemical stripper, mostly because I was pregnant and wanted to minimize my exposure to chemicals (the area was always well ventilated and I always wore PPE!). I was taking a risk by sanding because the cabinet is a veneer and there was a good chance I would sand through the nice wood veneer and end up with the ugly wood underneath. Thankfully, that didn't happen, and the process of stripping the cabinet portion was fairly quick and easy. I used Minwax English Chestnut stain and Minwax Polycrylic to refinish the cabinet per the instructions on the can. Nothing unique or fancy about the process. I then took another really long break before starting the door. The cabinet was mostly flat, so I could use the orbital sander. The door had all the detail work, and so most of the sanding had to be done by hand. It took forever. Ben also had to do some chemical stripping in some of the nooks and crannies that the sand paper just couldn't reach. I put the decal labels on after staining, but before the acrylic. It turns out I should've done at least one coat of acrylic before placing the labels. It looks okay, but there is a little bit of cloudiness around the letters that no one but me would ever notice. After I finished sealing the door with acrylic, it was time to add the faux finish to the door and cabinet. The faux finish had been one of the things that first drew me to the radio, and I was hopeful. I found a guy that made replacement faux finishes for radios, but mostly for the front of the smaller tabletop style radios. He made me some custom decals for this radio. I followed the instructions included in the package and in his Youtube videos, but I was not thrilled with the results. The decals had a hard time going around the curves of the radio, and so it ended up being a more time and labor intensive process then I had anticipated. Once they were applied and sealed, I didn't like them. It's difficult to tell they are even on there. If I had to do it all over again, I wouldn't bother with the faux-finish decals. Out of the entire process, this is what I was most disappointed about, because the original faux finish was so interesting! And now, at long last, the entire thing was refinished. 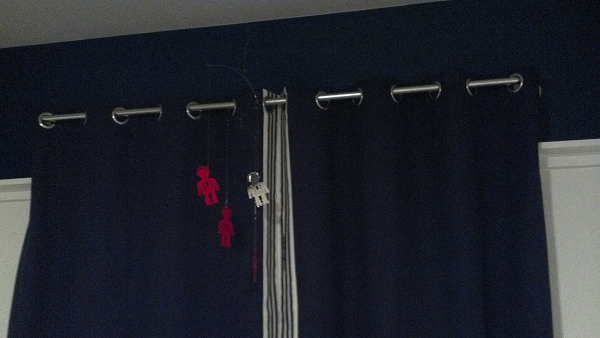 I will turn it back over to Ben for the hanging of the door and light installation. Up next is the door and the circuitry. Starting with cutting the door, the interior of the cabinet needed to be reconfigured to make it workable. My across-the-street neighbor has a nice woodshop in his second garage, so I asked to borrow his table saw to cut the door. I finished up the top and bottom with a hand saw. The interior of the cabinet required removing the shelf and all its supports, and reinforcing areas that bear weight. Chiseling out these little triangular shelf supports was the worst part of this. They tended to splinter instead of coming out cleanly. 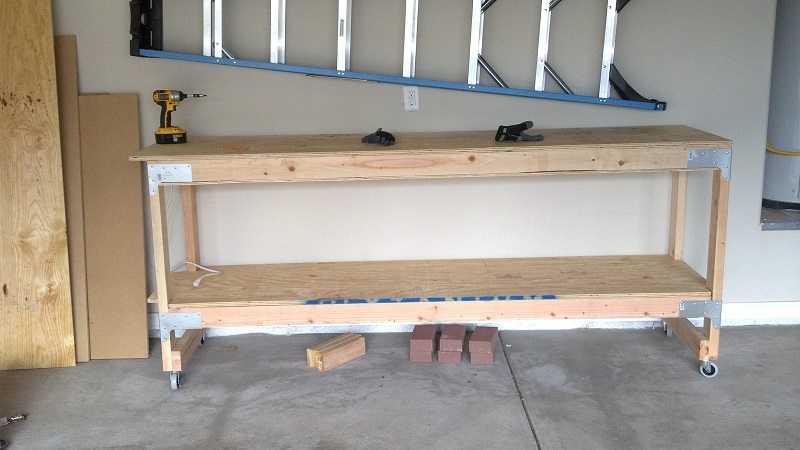 Once the shelf was out, I used it to template out the two shelves I intended to reinstall into the bar. I made the shelves out of some MDF I had laying around. 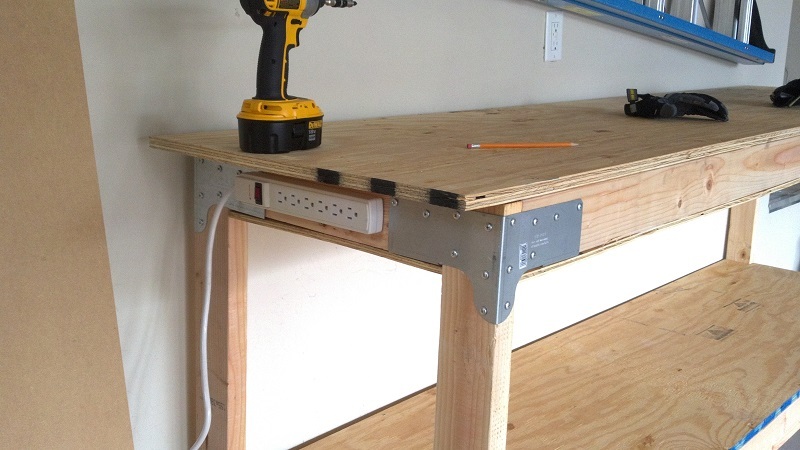 I used clamps and wood glue to secure everything. I was planning on using a piano hinge to hang the door, I used that to double check the width of the reinforcement pieces I glued in to the front. I glued in the new shelves and some reinforcement for the hinges. 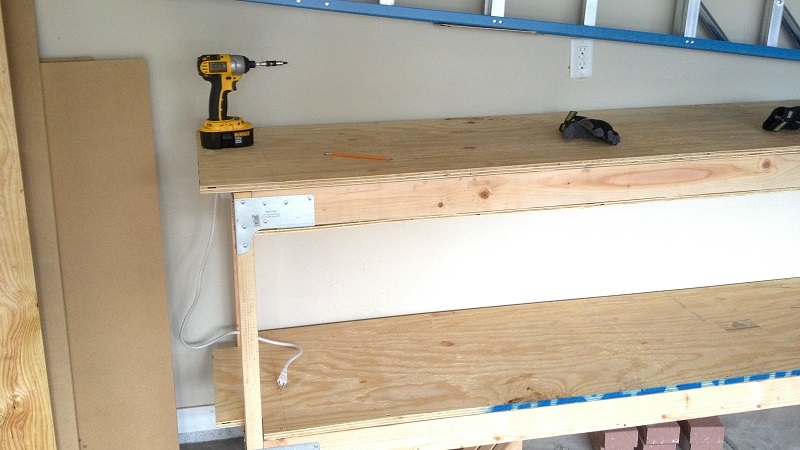 Once the hinge area was reinforced, I put the new shelves in, including to smaller ones in the top area. Supports and a little extra mass to hold it all down. You can see where the old shelf was, just a bit higher. Up next is the finish work on the wood. I'll turn that over to my wife, since she did all the refinishing. Now that we had the radio cabinet home, we could begin to remove the radio parts and faceplates before attempting to cut the door into the front. Pulling out the radio was relatively easy. I took out a few screws, and pulled the whole assembly out the back. Getting the face plate off was a little harder. The screws were hidden behind the rocker buttons, and I couldn't figure out how to get to them. It turns out, there is a spring-loaded pin that holds the plate with the buttons in place. With the cabinet bare, I took some measurements of where I wanted to put the door. We cut out the shelf the radio was on, but we decided to put another one in a similar place, with enough room for bottles on top. It turns out to be a really good place to display things through the dial glass. I also ended up making some new shelves on top of that, but we'll get to the interior modifications later. Based on the plans, my wife put some painter's tape in the areas I wanted to cut. This keeps the splintering down when you cut with a saw. On the inside of the cabinet were two tags. One had the model number, plus all of the patents Zenith claimed on the design of the radio. There was also the business card of a local radio repair shop. We decided to keep them both. The business card came off the shelf ok, but we had to leave the Zenith tag, and mask it for later painting of the interior. Up next are the interior modifications we made to allow us to store bottles inside, plus cutting out the door. This is a project that has been a loooong time coming. My plan is to walk you through all the steps we took to restore, refinish, and alter the Zenith radio cabinet we found at an estate sale into the final item that is currently sitting in my library. 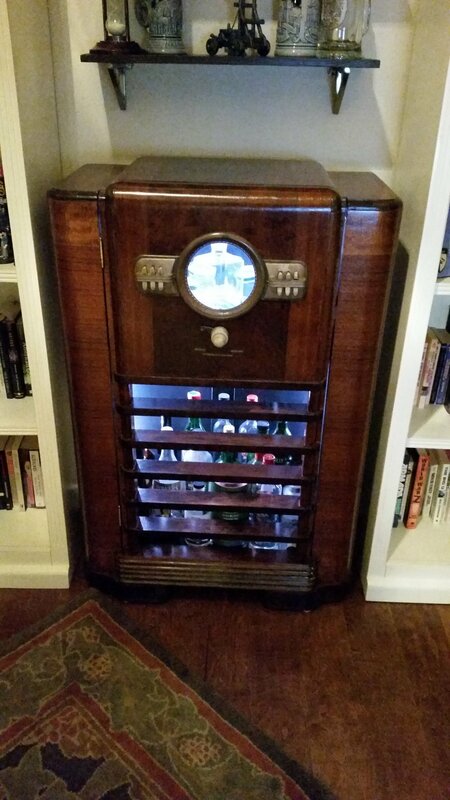 In 2015, my wife found a Zenith radio cabinet at an estate sale. I drove over to the old house, occupied by the same local family for years, to take a look at it. The radio was in pretty rough shape. It looked like it had gotten wet at some point, the tuning knob was missing, and it had all the usual wear and tear of 70 years. However, it seemed like we would be able to refinish it. We wanted to turn it into a bar cabinet, based on some things my wife had seen on Pinterest [dangerous!]. I brought the radio home, but unfortunately I didn't secure it well, and it fell over in the back of my RAV4, and I broke the glass. Now that I had it home, I could look into what I had found. This turns out to be a Zenith 1005 cabinet, with model number 10-S-464. I wasn't interested in the radio itself, as my electrical skills in this area are rusty and out-of-date, so I didn't think I could try to make the radio parts work, or replace them if they were broken, so I sold the radio parts, with all their vintage vacuum tubes, for $49. I broke even! We decided to make a door out of the front, differing from the example my wife found, which had to to be turned around on casters everytime you wanted to get inside it. My wife would handle the refinishing of the cabinet. I volunteered to light the inside, using one of the new spiffy microcontrollers that is so cheap these days. I figured I could find a way to integrate that with the dials and buttons on the front somehow. The plans were pretty easy to follow, and it cost us about $150 all told, but we did have some things on hand, like paint. It has been a while since I did anything with my Altoids Tin survival kit. I have acquired a few additional items, but progress has been slow while I have been concentrating on different things. I decided to make a few substitutions as well, and see how well it all goes. I'll probably end up with a couple of complete kits by the end. I wanted to get everything together first, and then worry about trimming it all down to fit in the Altoids tin later. With that in mind, I grabbed the tin from the watch I received for my birthday as a handy storage container. It has a better seal on it that the Altoids tin, even though it is quite a bit bigger. I also purchased an Essential Day Pack Bottle from Eddie Bauer that has a number of survival items in it while shopping today. It was only $10, so I consider this quite a score. For now, I'm stealing the matches, foil, paper & pencil, first aid supplies, food, and plastic bag and stuffing them in the watch tin. I actually use algebra most often of all the mathematics I have learned, with simple stats right after that. A couple of years back, I decided I wanted to brush up on my algebra, so I picked up Forgotten Algebra by Barbara Lee Bleau. It is a quick, breezy book that takes you through everything you really need to know. I found it kind of fun (sick I know). I worked through all the problems and examples, and I felt pretty good about it all. I jotted down some quick notes, which tonight I decided to typeset in LaTeX and post here. I needed a refresher on LaTeX too.